I used the same pie crust recipe as before. I made one-and-a-half recipes, using a third for the thin bottom crust and two-thirds for the top crust in the same shape as the pandowdy. That means it's hardly dietetic, since that's an awful lot of crust in one pie. I baked it for 25 minutes at 425F and the edges got dark pretty quickly. Since the cherries are already cooked, 20 minutes might even have done it. I'm used to baking apple pies, in which the apples are raw, so the cooking time is significantly longer. I suppose it's possible that the combination of a good crust and a fantastic filling could somehow go awry in the baking process, but it seems unlikely. I'll let you know soon. If it's as good as I suspect, I'm considering cleaning, pitting, and freezing a bunch of cherries for cherry pie year-round. Place flour and salt in the food processor and pulse a few times to mix. Add butter and shortening and pulse on and off until fat is reduced to large flakes. Sprinkle all over with sugar and pulse for 1-2 seconds to blend. In a small bowl, beat egg yolks with 6 tablespoons ice water, then pour over flour mixture, and pulse to combine until a rough dough begins to form. If it seems to dry, add a little more water a few drops at a time. Turn the dough out onto a piece of plastic wrap and press together into a smooth flat round. Cut dough in thirds, wrap each piece in plastic wrap, and refrigerate until ready to use. 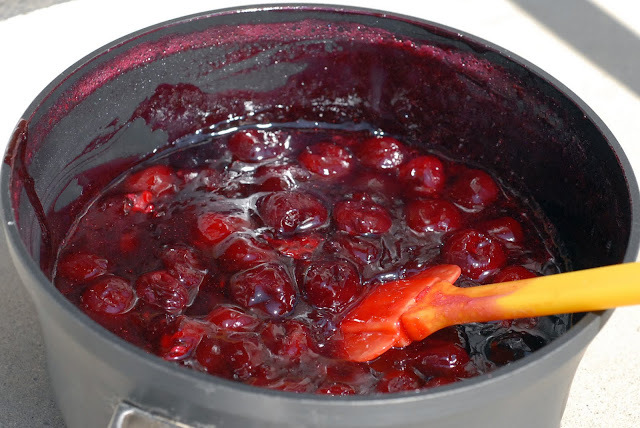 In a large saucepan, combine the cherries, sugar, lemon juice, and lemon zest. Cook over medium heat until soft, stirring somewhat regularly. It will start to boil pretty wildly and foam up. Reduce the heat and let it continue to cook. Ladle out some of the cherry juice and stir it together with the cornstarch to dissolve the cornstarch it will be a lovely Pepto pink), then add this mixture back into the cherries. It will thicken rather quickly and the sauce will turn a clear, dark red. Remove from the heat and stir in the almond extract. 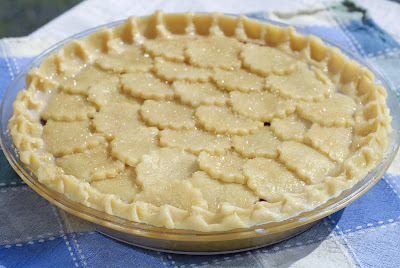 Let the mixture cool a while before assembling the pie; otherwise, the heat will melt the pie crust! Jenn says I could have made the filling in advance and refrigerated it. 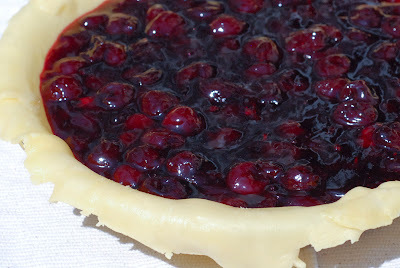 I imagine it thickens in the fridge like cranberry sauce does, so I'd recommend taking it out in advance and giving it a few good stirs before assembling the pie. If it is really stiff, you could probably warm it slightly on the stovetop. I made my pie on Friday for Saturday company on the notion that pie keeps well overnight. That's why housewives have been making it for centuries, right? 1. 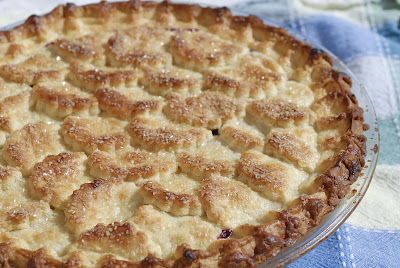 Pie crust can be patched and no one will ever know. 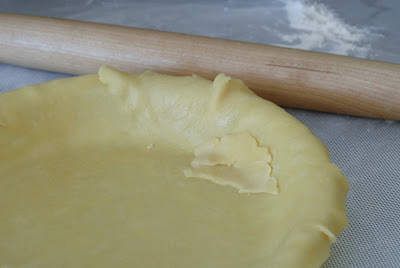 Rolling out piecrust seems to intimidate a lot of people, but don't let it get the better of you. If you tear a hole, just slap on a patch of crust and move on. 2. Don't spend so much time food styling and photographing that your pie starts to melt. My zeal, combined with hot pie filling and crust that had been out of the fridge a while, meant the pie started to look a little droopy. Luckily, the oven was preheated! 3. Take pictures where there is light. It works! It was soooooooooo yummy! Sooooo yummy! What a cute crust! Love it! !